ABS uses focused ultrasound waves and radio frequency to safely destroy fat, diminish cellulite and stretch marks, tone and tighten skin! Scientifically proven with no side effects, no surgery, no down time, and a fraction of the cost of comparable treatments. We can treat almost any area of concern and tailor a treatment plan just for you! 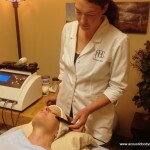 Read more about our safe, painless, and revolutionary treatments to renew the face, slim the body, flush the lymph system, and relax the whole body.